The resentment here over land that has been left uncultivated at a time of deepening recession and record joblessness reaches beyond local politicians and landowners to European Union bureaucrats. Agricultural subsidies are criticized by many here as favoring landed interests, paying them not to grow crops when nearly a third of the work force in Andalusia is unemployed. These European subsidies only serve to enforce this kind of agricultural unemployment, as their payments are based on the size of the landholding–not its productivity. Therefore, since wealthy landholders do not have incentive to grow crops, giant landholding estates can reap the benefits of the subsidies without having to employ workers to produce anything. 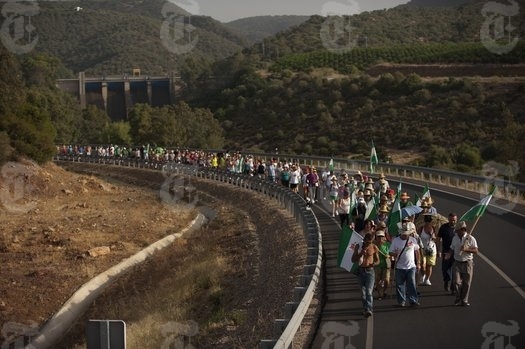 Many different groups in Spain have been displeased with Prime Minister Mariano Rajoy’s economic policies for the past three years, but the aggression apparent in these agrarian protests is reminiscent of similar disputes that took place in Spain leading up to the Civil War. The New York Times points out that, “as Spain’s biggest region and farming heartland, Andalusia was the site of many of the confrontations over land ownership leading up to the Spanish Civil War, when a landed elite resisted an agrarian reform meant to give farm hands better work conditions and job security.” The protest has been growing since August 16th and now has over 500 members, led by Diego Cañamero, the head of the Andalusian Union of Workers. Another leader, Juan Manuel Sánchez Gordillo, stresses the importance of the march on unused agricultural land in Spain because, “the pain of Spain’s downturn is being felt not by the bankers and property developers who set off the financial crisis, but by the most vulnerable, particularly as the country struggles to meet the mounting demands for austerity by European Union policy makers and investors.” The effectiveness of these protests remains to be seen, but it is clear that Spain’s elite is watching, along with the rest of the world. The world should look at Gordillo’s Marinaleda as a light in the darkness. All these decades later, the dreams of the Republic and its workers aren’t dead yet. What good is expected to come from the government paying landowners not to grow crops? It seems as though it would do more good to give these subsidies to the workers that are unemployed due to these policies. Pacifying wealthy land owners while leaving workers without work in a country with such high unemployment rates baffles me. When will governments stop catering to the well to do?